There’s no Homework Club this week. Instead, we’re looking through kaleidoscopes for inspiration and building a storytelling app to help kids create and share stories! Thanks to your overwhelming interest in our events for young storytellers, registration for our final two workshops (Story-Making Through the Lens and Design a Story Making App) is now full! Thank you to those who signed up their kids. 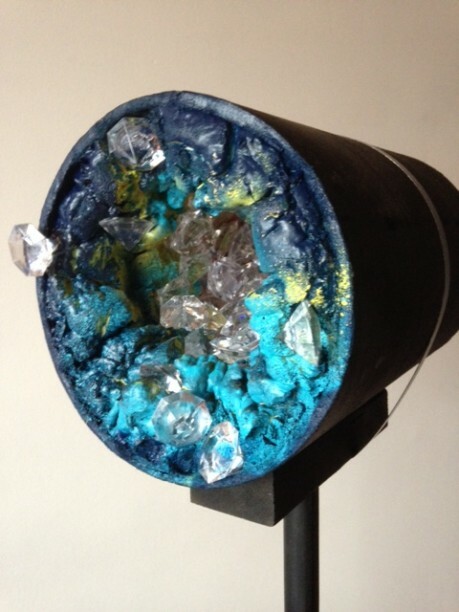 If you missed this week’s workshops, check back soon. We’ll be announcing more fun workshops in 2015! We hope you’re having a safe and story-filled holiday! Our spaceship may have pulled over to refuel over the holidays, but we’ve got plenty of fun activities for young storytellers coming up next week (December 29 and 30)! We have two new events for young storytellers coming up on Monday and Tuesday of next week! 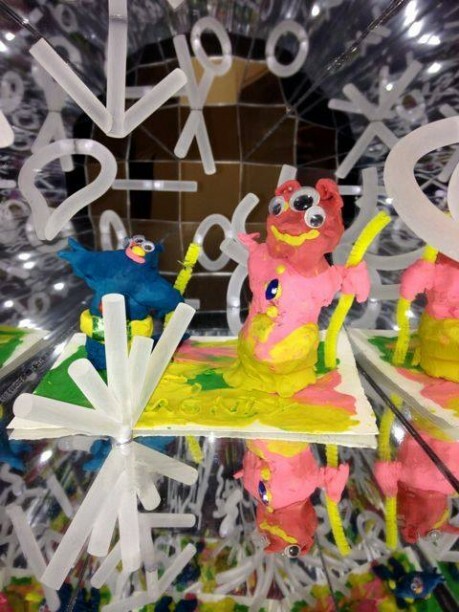 On Monday, during Story-Making Through a Lens, writers aged 7 and up will be creating a character, using funky kaleidoscopes to create a setting and working together to write a story. 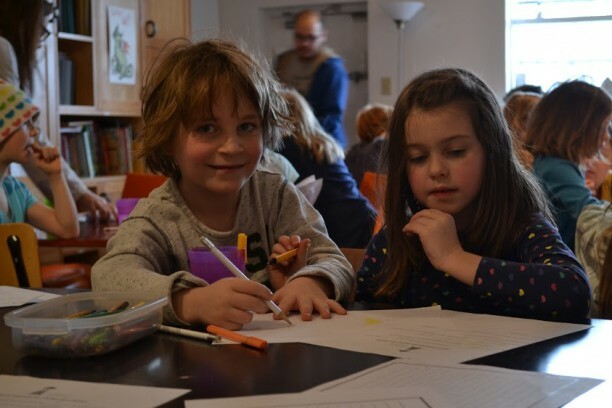 On Tuesday, during Design a Story Making App, 8 to 11-year-old storytellers are invited to help us design an app that helps kids create and share their stories! Email Liz Haines at liz@storyplanet.ca for more information. Last Thursday, author Brian Francis came by Story Planet with lots of great tips for adult writers about creativity, social media and staying connected with readers. Different writers like to reach out to their followers in different ways: some like to keep their fans updated on what’s going on with their daughters’ warts, but others, like Brian, prefer to blog about a subject they’re interested in that might appeal to their followers (check out his awesome Caker Cooking blog). No matter what you blog about, if you put effort into your project and stick to a regular posting schedule, you’ll give yourself an excuse to write on a more regular basis, you’ll have easy access to an audience and your ability to focus will improve dramatically. If you missed Brian’s workshop, be sure to check out his blog and his novels Natural Order and Fruit (a finalist in the 2009 CBC “Canada Reads” competition). Last week’s class was our last in 2014, but we’ll be announcing another series of The Write Space workshops for adult writers in the new year. Our holiday gifts are out of this world! Still shopping for that aspiring writer/artist on your list? Come by the Intergalactic Travel Authority (the store and coffee shop attached to Story Planet) and check out our collection of books, gadgets and Earth souvenirs! All of the proceeds from the Intergalactic Travel Authority go directly to Story Planet, which helps provide free programs to writers of all ages living in Toronto. We hit a bit of turbulence last week when our Thursday night Write Space workshop for adult writers was rescheduled (to this Thursday, December 18) due to interplanetary blizzards… but it wasn’t long before we were back on track! 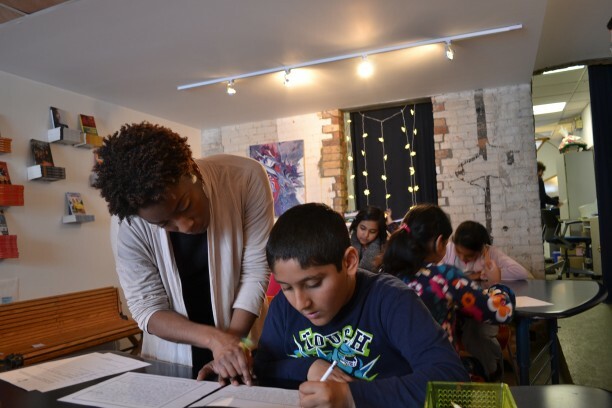 The very next day, we welcomed the grade 4 class from Thorncliffe Park Public School for their very own Alpha Workshop during which they got a very important assignment from Mars..! ADULT WRITERS: If you thought you’d missed your chance to attend our Write Space workshop with author Brian Francis, you’re in luck! We had to cancel last week’s event because of the snowstorm, but we’re definitely back on for THIS THURSDAY at 6:30! During his class, Brian will be discussing how to use technology and social media as well as self-publishing options to boost your creativity. We’re sorry to those who might have been inconvenienced by the last minute rescheduling of last week’s event, but we’re looking forward to seeing you this Thursday! Check out the event page for details and ticket prices. Last Friday, the grade 4 class from Thorncliffe Park Public School came to Story Planet for an Alpha Workshop and received an unexpected phone call from the publishing office on Mars! The students were given a very important assignment: to write and publish 20 original stories by the end of the day. As a result of their hard work and collaboration, by the end of the workshop, our 20 students were successful in their mission and the Mars office was saved! Thanks again to the kids who helped out. We had so much fun! Still looking for something to get your aspiring writer/artist for Christmas? Come by the Intergalactic Travel Authority (the store and coffee shop attached to Story Planet) and check out our collection of books, gadgets and Earth souvenirs! We’re still buzzing from all of the excitement last week at Story Planet! Thanks again to all of you who sent in your #StorySelfie and donated to our literacy programs for Giving Tuesday. Last Tuesday, we asked you to send us a #StorySelfie (a picture of yourself reading in an unusual spot), and you delivered! We received photos of you reading in boxes, in closets, by windows, and even Black Friday shopping! While we didn’t quite reach our fundraising goal this time around, we’re extremely grateful to everyone who donated to our literacy programs for Giving Tuesday. Every penny counts when we’re organizing awesome events. In fact, thanks to your generosity, we can now run two more free Alpha workshops, serving an additional 50 kids! If you didn’t get a chance to contribute on Giving Tuesday, it’s not too late! Follow this link to donate to Story Planet now! During our free PD day Alpha Workshop last Friday, our students brainstormed ideas, wrote a story as a group about Pippy Darrell, a talking book shaped like a banana, and worked with a professional artist to bring their story to life. Once they were finished writing their own ending to the story, each student was given a copy of the book they’d worked on to bring home with them. Thanks to everyone who participated. We had the best time! Stay tuned to find out when we’ll be hosting another Alpha Workshop! Adult writers: Are you taking full advantage of your social media? This Thursday during The Write Space workshop at Story Planet, author Brian Francis will be discussing how to use technology and social media platforms like Facebook, Twitter, blogs, Instagram, as well as self-publishing options to boost your creativity. Check out the event page for details and ticket prices. We’ve got a big week ahead! 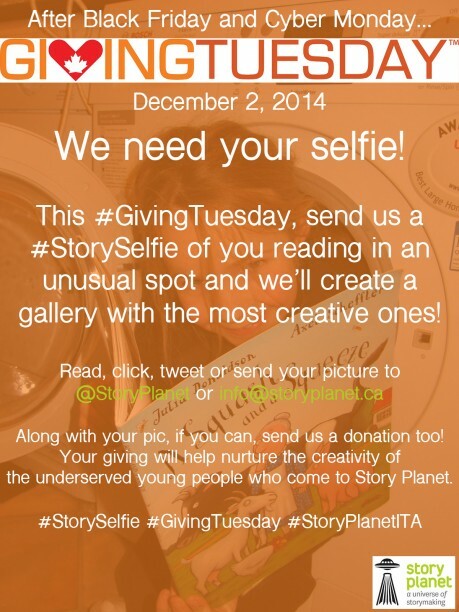 Thank you to those who have already donated to Story Planet for Giving Tuesday. Your contribution goes a long way in supporting our literacy programs. We couldn’t do it without you! This Giving Tuesday, take a picture of yourself reading in an unusual spot and tweet it @StoryPlanetITA or email us at info@storyplanet.ca for a chance to have it featured in a photo gallery on our website! Giving Tuesday is an international day where we’re all encouraged to celebrate and contribute to the activities that support charities and non-profit organizations around the world. Check out what Giving Tuesday is all about and, while you’re online, go to storyplanet.ca/donate-to-story-planet/ to donate to our organization. With support from people like you, Story Planet inspires people young and old to be creative and effective communicators. We encourage them to develop their own unique voice and help them launch their stories through writing, visual arts and digital media. This Friday, we’re hosting a visual storytelling workshop for students in grades 2‑8. They’ll get to brainstorm ideas for a story, see it come to life with the help of a profession artist and write their own individual ending — all in one two-hour workshop! Because of overwhelming interest in this free event, registration is already filled up. If you missed this one, be sure to check back regularly to hear about other events we have coming up for young writers. Thanks to those who signed up their kids. We’re really looking forward to it! Observation is one of the most valuable tools in storytelling. But, when starting out, many writers forget about their other senses and stick to describing what everything in a scene looks like. Imagine you were reading a story about a pie that’s about to fall on the floor. Wouldn’t you be that much more invested in the fate of the dessert if you knew it smelled like sweet, warm apples and cinnamon just like the way grandma used to make it? Anthony e Sa had the class bring in an object that held special meaning. Then, with those objects in hand, he had them write down and discuss the observations they’d made using all five of their senses. While they may not make a habit of licking sentimental objects any time soon, those who attended Anthony’s workshop left feeling inspired by his talk and excited to get writing. It was a real treat having Anthony — sweetened even more by the Portuguese custard tarts and copies of his new book, Kicking the Sky that he’d brought for everyone who attended. If you missed last Thursday’s workshop, the next one will be with Canada Reads finalist Brian Francis, on December 11. Check our website for details and ticket prices.